The timing for Paisley Maze could not be more perfect. It seemed that five years ago, there were practically no psych rock bands in the area. Ever since the emergence of Moon Waves (who recently disbanded), however, the genre’s popularity in the DFW area has exploded. I’m not sure Mijana could have assembled a more perfect regional sampling of psychedelic acts than he did. His own act Monoculture combines elements of blues with psychedelia in seamless style. Acid Carousel and Natural Anthem are among the most popular local acts in the genre, with both acts bringing a gorgeous modern spin to 1960’s psychedelic pop. Native Fox, though not as well known as the two aforementioned acts, are equally adept at psych-pop. They’re also equally deserving of your attention. Sunbuzzed may be the newest band on the list, and perhaps the most relatively unknown act, and yet they’re becoming one of The Ghost’s favorite new acts. Sunbuzzed evolved from Space State, whose song “Daisy” was a HUGE favorite of yours truly. Sunbuzzed definitely exists on the heavier and fuzzier side of psychedelia, yet still manages to retain a dreamlike quality to their music. Do not show up late to the fest and miss this band. If I were you, I’d be getting your tickets ASAP. I could be wrong, but this is such a unique event that it could easily sell out. 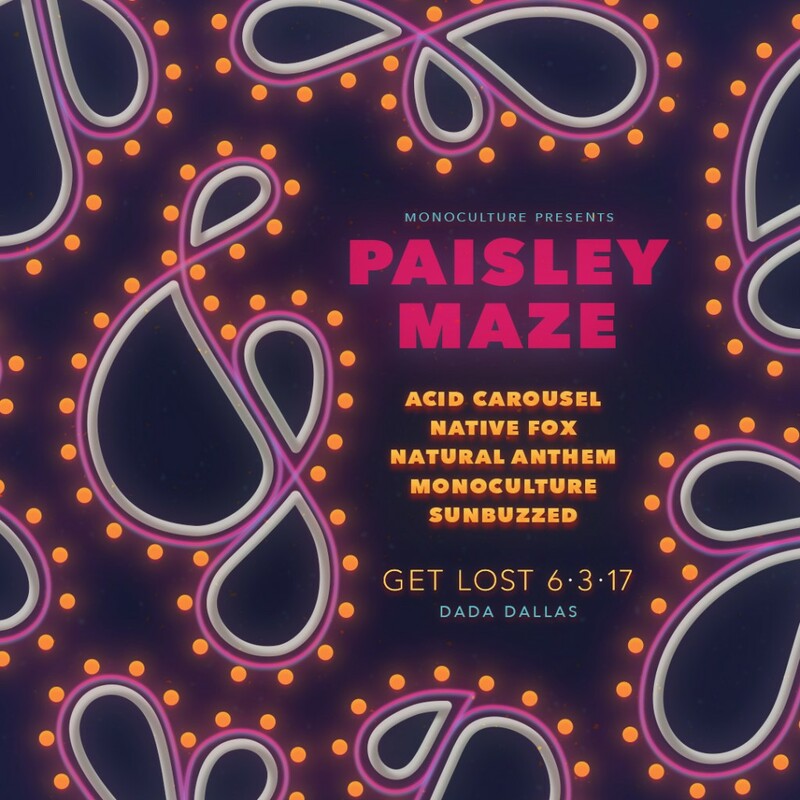 DALLAS, TX (March 15) – Dallas-based psychedelic rock group Monoculture introduces DFW’s first ever psychedelic rock music festival, Paisley Maze, to take place on June 3, 2017 at Dada in the Deep Ellum district of Dallas, Texas. Along with Monoculture, psychedelic rock groups from all over DFW will represent the ever-growing scene: including Acid Carousel, Native Fox, Natural Anthem, and Sunbuzzed. In addition to music, Efgen Mijana will curate a comprehensive selection of talented, local DFW artists to display their works in a gallery format (TBA). Tickets are on sale now through the Paisley Maze website. General Admission is $10. All ages are welcome. “When we heard that Levitation in Austin was cancelled this year, we toyed with the idea of doing a psychedelic festival in Dallas,” says Olan Mijana, Lead Guitarist and Vocalist for Monoculture and Co-Founder of Paisley Maze. “And the more we talked about it, the more we realized how doable it was. Paisley Maze is a one day lights, music and art experience centered in Dallas’ live music hub, Deep Ellum. It is the first ever official event in DFW geared towards the appreciation of psychedelic music. Come out and get lost in the Paisley Maze. Stay tuned for a second round of announcements soon.